Thrashzone Hop Deicide. The original. The beer that put Thrash Zone on the craft beer scene in Japan and perhaps the best known beer from the Thrashzone Brew Labo range. It’s an imperial IPA that has an abv upwards of 8.5% depending on the batch. It has got stronger over time with the original starting at 8.2% and the current iteration of Thrashzone Hop Deicide coming in at 8.9%. It was the first beer brewed at Atsugi Beer and is still brewed there to this day. It’s packed full of Simcoe hops – guess what analogy is coming up in the review? 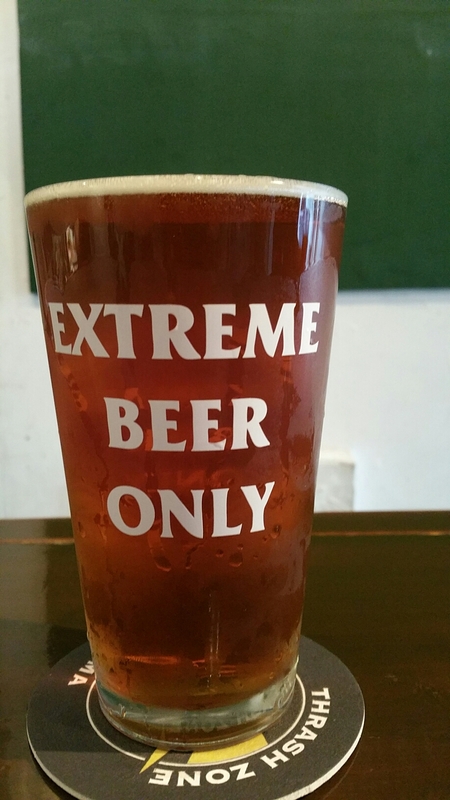 The FIRST extreme beer from Thrashzone Brew Labo. Thrashzone Hop Deicide was the first beer that I had at Thrash Zone way back in 2009, or was it 2010, anyway, I remember drinking it to this day as it knocked me for six. And then some. The intense hop flavour initially put me off as it was before the heady heights that IPAs would reach in 2013 onwards in Japan. Some more were drunk and then it hit me – well Katsuki-san telling me it was 9% and I had just sunk a pint. Even to this day, Thrashzone Hop Deicide is a beer that deserves respect. It’s intense Simcoe aroma produces massive amounts of pine, grapefruit, and, on occasion when I’ve had a batch at the end of its life, some funky cat piss aroma. Thankfully, that doesn’t occur often now due to the turnover in Thrash Zone but Thrashzone Hop Deicide really did set the standard for extreme beer. Where Thrashzone Hop Deicide deserves the utmost respect is drinking it. Even at 8.9%, the beer is incredibly easy drinking when served cold and even with the intense hops flavours in the body. It’s bitter and citrus along with managing to bring a touch of sweet malts to the body as well. This time around, I took my time (I was reading one of the many books in Thrash Zone while drinking and chatting) and took me 45 minutes to drink a pint. Yet I still ended up a bit giddy after drinking. Thrashzone Hop Deicide is an intensely hoppy imperial IPA that should be drunk with care. If you’re new to IPAs, then avoid this and try something gentler instead just to get your bearings. Hop Deicide! Yaaaaaaaaaah! Second best Japanese IPA evaaaaaar!